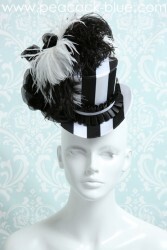 A spotlight will always be following you when you’re wearing our show-stopping Center Stage topper! 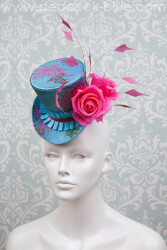 The carnival inspired “Can-Can-Candybox” version of our jaunty top hat is made of hand-dyed red and pink striped satin with a matching braided band and trimmed with oversized ribbon roses, red floral venise lace and curling sprays of red peacock sword feathers. 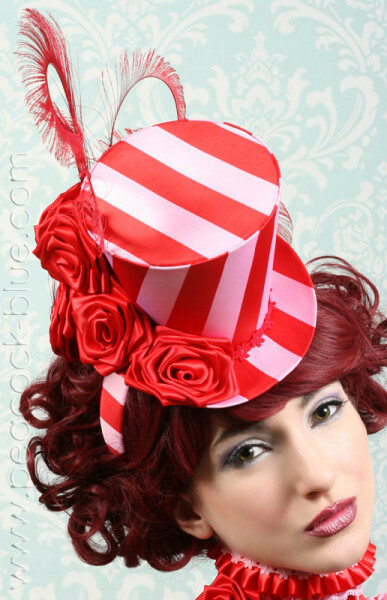 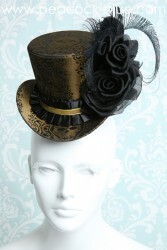 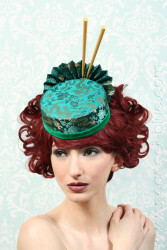 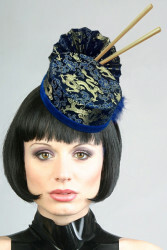 This cocktail-style top hat fastens securely to your head with a matching satin-covered headband and small comb. 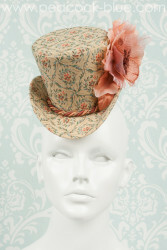 This is a one-of-a-kind piece that will not be made again. 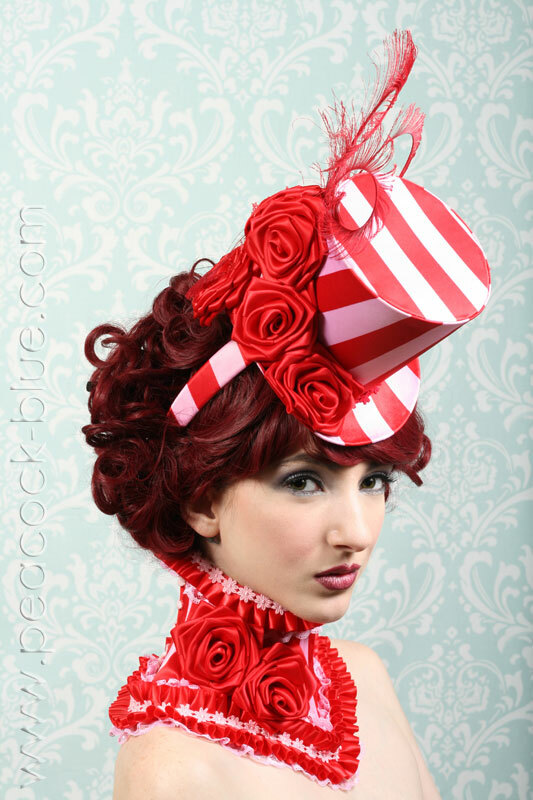 As seen in the “Be My Valentine” feature in the February 2014 Issue of Tenebrous Magazine (Photographer: Fotografica Gregor; Model/MUA: Katlin Sumners ). 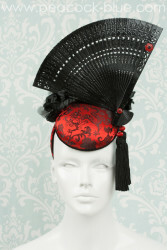 Our Gwenllian headpiece is a crowning glory that would be perfect for a warrior queen. 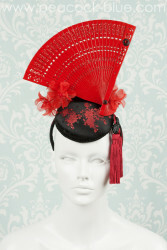 The cap is embellished with a myriad of hand-applied designer motifs in red sequins, bugle beads, seed beads, Swarovski crystals and floral components. 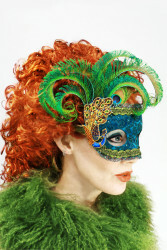 The winged sides of the headpiece proudly display fans of red peacock eye feathers. 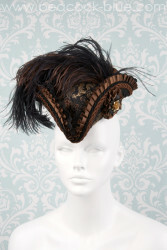 Strands of bugle beads and crystal teardrops dance and swing, one on each side of the cap. 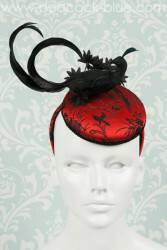 We've lined the cap in soft, dark red millinery felt. 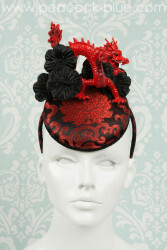 We provide FREE domestic Priority Mail shipping for the Gwenllian headpiece. 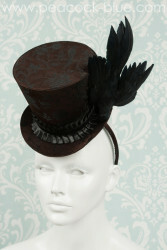 This is a one-of-a-kind item and will not be made again. 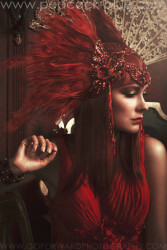 This headpiece was featured in the "La Vie En Rouge" editorial in V.5 for Giuseppina Magazine. 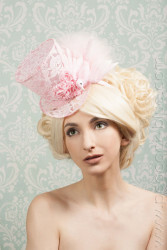 Photographer: Michael D. Ward/ Go ForWard Photography; Model: Jana Kolarikova; MUA: Hannah Elvington; Hair: Wendy Ward. 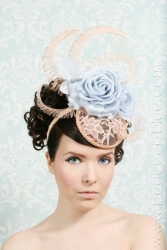 We're serving up a sweet little treat with our Les Tartes fascinator series in an array of pastel colors inspired by cakes and confections! 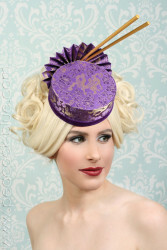 The flirty little “Lavender Lemonade” version of our fascinator-style button hat is made in yellow re-embroidered lace and trimmed with hand-dyed scroll braid, lavender silk roses, yellow loop fringe and a spray of hand-dyed lavender stripped coque feathers. 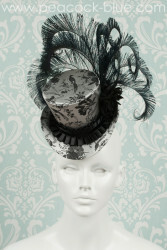 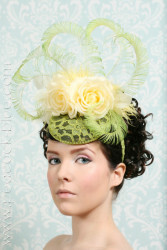 This cocktail-style fascinator hat fastens securely to your head with the matching lace-covered headband and small comb. 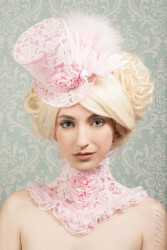 You will draw the attention of everyone around you when you’re wearing our Crimson Queen braided headpiece. 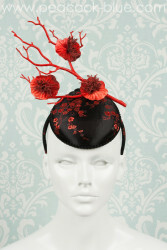 This striking work of wearable art is designed in dark red braids with brass ornaments, gold beads and red Swarovski Crystals. 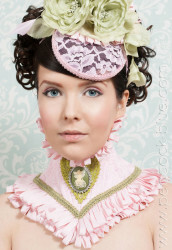 A matching china doll style wig is included for a complete look. 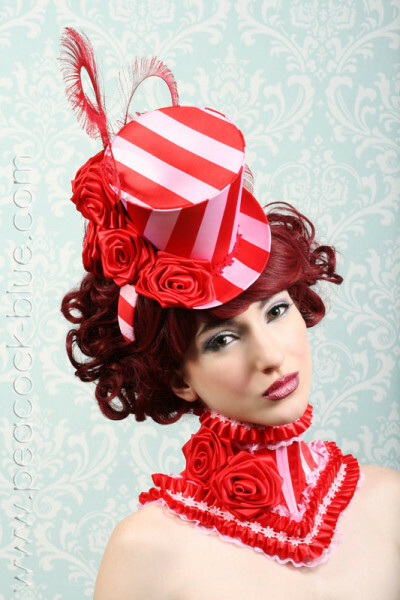 While this piece includes a matching wig, we highly recommend that your natural hair length be enough to create a French braid to wear underneath. 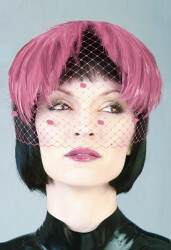 It will help provide a way to best secure the headpiece. 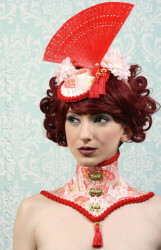 We provide FREE domestic Priority Mail shipping for the Crimson Queen braided headpiece. 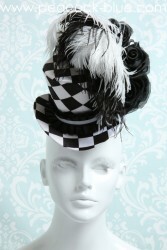 This is a one-of-a-kind item and will not be made again. 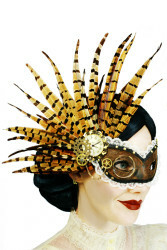 This headpiece was featured in Issue 305 of Surreal Beauty Magazine. 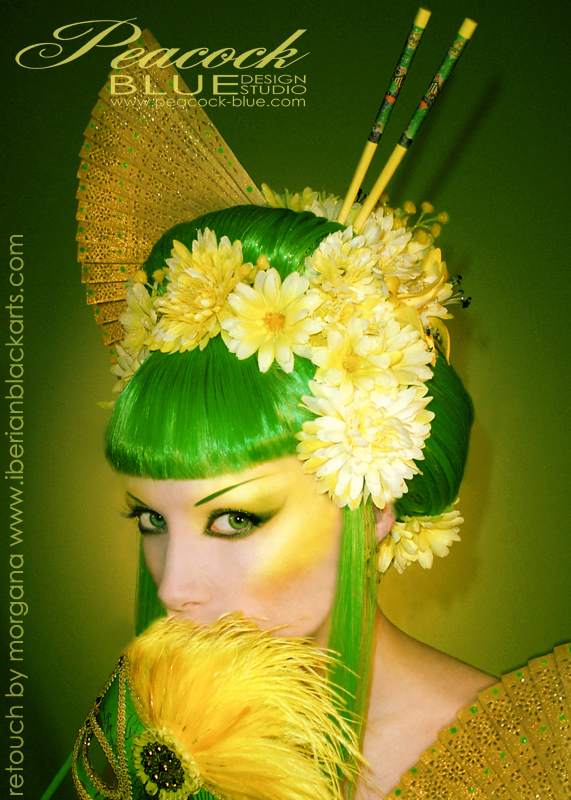 Photographer: Michael D. Ward/ Go ForWard Photography; Model: Jana Kolarikova; MUA: Hannah Elvington; Hair: Wendy Ward.